Goodreads review: How Music Works | Yeah nah. 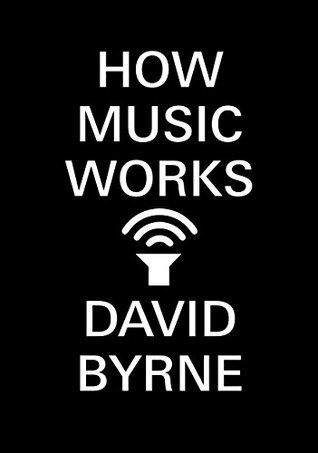 So, David Byrne knows a thing or two about music. This shouldn’t be surprising. After all, he’s been a recording artist and performer – two very different things – for well over 40 years now, and he’s renowned for his creations and collaborations. I’ve been a fan – though not a rabid one – for a couple of decades, and so I figured a trawl through this was in order. What I found was a weird (yet enjoyable) hybrid: it’s neither a scholarly deconstruction of music and performance nor is it a memoir of Byrne’s bands and times – though it has elements of both those types of work. It doesn’t aim to be conclusive, but it is filled with a lot of further reading. Instead, what we’re provided with is an examination of both the history and current state of music, as refracted through Byrne’s experiences working in the artform. It makes for an intensely personal, well-footnoted read that gives enough of a sense of how his work came to be (while sidestepping some of the acrimonious interpersonal issues) in context of music as a whole. What was surprising was how warm and enthusiastic Byrne appears. It’s like reading something written by a goofily enthusiastic mate rather than the odd, remote visage that’s often been presented. He makes reference to the peculiarities of his personality in the text, sure, but this is solid writing with a real investment in the topic. Moving between music generally and the music business specifically, there’s no superiority on show, just a sense of practicality: you name the deal type and Byrne’s probably done it. His dissection of finances and criticism of classic record-deal mentality is spot-on, and he grounds his reasoning in the idea of approaching music as not a fountain of riches, but the potential basis for a career. A dream? Maybe. But something that should be more common – and something the author has ideas about encouraging. It’s reassuring to read the story and thoughts of someone who’s worked in and out of the label system in what are undoubtedly considered its glory days – or at least the days before apocalyptic financial fuckery loomed – and to know that he’s enthusiastic about how things are today. We read over and over that the music business is going down the drain, but this is actually a great time to be making music—full of possibility. A life in music—which is what we’re actually talking about, not just fame and glory—is indeed still possible. How Music Works is five years old now, and I found it one of those rare books that makes me want to get up and write something; it makes me want to play guitar and make some music. For me, that’s a good indicator that it succeeds: it reminds the reader what they love about music, and prompts them to engage more.